Juices, smoothies, kombucha, beer, mead, cider and natural sodas. Crafted with a Caribbean palate using New York grown produce: seeds, fruits, vegetables, herbs, spices, flowers and teas. November 24, 2018 – Brooklyn NY, Small Business Saturday: Island to Island Brewery will be releasing its “Origine People Power Beer” project in collaboration with SHOP ORIGINE, Detained Migrant Solidarity Committee’s Fronterizo Fianza Fund DMSC, PEOPLE POWER BEER & ACLU. Follow Up Fundraiser December 15, 2018 we’re shooting to raise a total of $1,000! We’re honoring our pledge to support the Detained Migrant Solidarity Committee’s (DMSC) Fianza Fund and the ACLU People Power movement. People of Aboriginal heritage and indigenous to the Americas are losing rights and being abused by the justice system and USA citizens are angry about about. This is our opportunity to support a community in need and offer real results from organizations that are doing grassroots work. 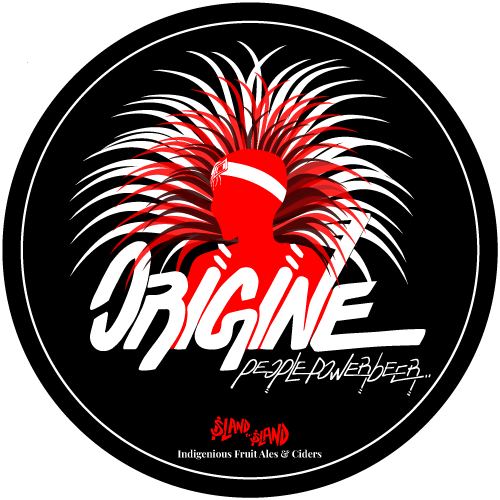 The “Origine People Power Beer” by Island to Island brewery is a Caribbean black cake imperial porter 9.1% ABV. 10% of proceeds will be donated to help aboriginal people detained at the borders. Black Cake is a traditional holiday and celebration day cake in Central & Caribbean America – the same region this event will support. The cake is a celebration item that brings people together. Black Cake, also known as Fruit Cake or Rum Cake has a deep rich flavor with a variety of rum soaked candied fruits mixed in to the batter. Our founder and head brewer Danii Oliver crafted this recipe with all the same ingredients of traditional Black Cake using 1886 NY State grains; Owney’s Rum, a woman owned woman distilled rum made in Brooklyn New York blended with Taino Dominican rum. The Fianza Fund is a community-supported bail fund that pays the bails of undocumented people detained by immigration enforcement. In the past, they’ve partnered with Queer Detainee Empowerment to pay the $8000 bond of Joel, a queer Jamaican, Arawak man seeking asylum in the US. Today, they’re raising money for the $7500 bond of Antonio, who sought asylum after fleeing racial discrimination in Honduras and was separated from his family at the border. Find ORIGINE brand merchandise at shoporigine.com. ORIGINE emphasizes on the importance of being a proud American. For those who don’t know Origine means a person who has origins in the Americas aka those who are being disfranchised by I.C.E. and various cases of border discrimination like travel bans; families being ripped apart and voter suppression. Our goal is to bring awareness of Origines everyday struggles. We honor our ancestors who were outcast, exiled and even killed for just being original to America. We honor our elders and ancestors who was reclassified and had their indigenous rights stripped from them. Music by: "Adlan and Friends"
Enjoy behind scenes tours and tastings with the head brewer.